Our Blowers & Vacuum Pumps cover pressures up to 25 PSI and vacuum to 29.9” Hg. A recognized leader for low pressure and vacuum applications in the Midwest, we serve the industrial, municipal, medical, environmental, oil/gas and pneumatic conveying markets. 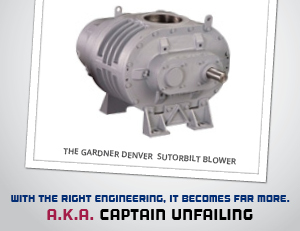 We offer the most recognized brands in the low pressure and vacuum equipment marketplace: Gardner Denver (Cyclo blower, Duroflow, Sutorbilt, Heliflow, Hoffman, Lamson), Travaini, Airtech, Busch, Squire Cogswell/Ohio Medical, and HSI Centrifugal.